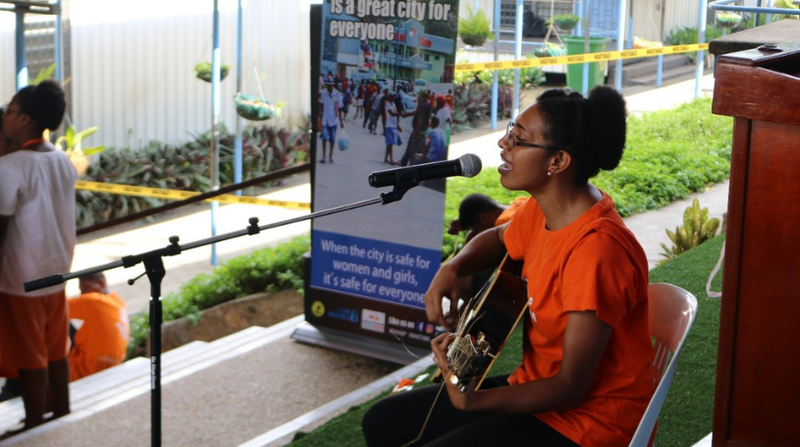 UN Women in PNG has launched a new song composed by Jobecca Watinga, a final year accounting student at the University of Papua New Guinea. She wrote the song after attending one of Sanap Wantaim’s campaign concerts on promoting Port Moresby as a safe city for women and girls. “I am from a loving Christian home, where it’s peaceful with no exposure to violence. However, this is not the same for many. The song is about the dreams of many young girls in Papua New Guinea (PNG) for the future we want – a safe violence free society,” said Watinga. Through this song Watinga wants to raise awareness on ending violence against women and girls and making our communities safer. The girls from Marianville Secondary School who first listened to the song during one of Sanap Wantaim campaign activities, were touched by the lyrics since it also reflects their dream of a safe city where they can freely move around without fear of intimidation or harassment. They have joined forces with Watinga through this song to show solidarity for ending violence against women and girls. The launching is part of UN Women’s 16 days activism against gender-based violence.